Clorox Wipe, Clorox Disinfecting Wipe, BUY Clorox Disinfectant Wipe, CLO 01594, CLO 15948. Lemon Fresh Clorox Wipes, manufactured by Lagassee, are cleansing wipes that are designed to kill bacteria on a variety of surfaces using a number of different cleansing ingredients. Clorox Disinfectant Wipes are perfect for home use or a clinical environment, because they are safe to use on counter tops, wooden surfaces, mirrors, windows or even floors. Unlike some other disinfectants, Clorox Disinfecting Wipes are a wipe. There is no need to spray on disinfectant and then wipe clean with rags that need to be washed later. Spray disinfectants create more work while cleaning. Clorox Wipes have ingredients that clean and sanitize in different ways, all the way down to the scent. These Disinfectant Wipes are fragranced with lemon essential oils, which contains grease fighting and antibacterial qualities. Clorox Wipes also contain a mix of antimicrobial, antibacterial, cleaning, and shine enhancing ingredients. Gets rid of the germs! 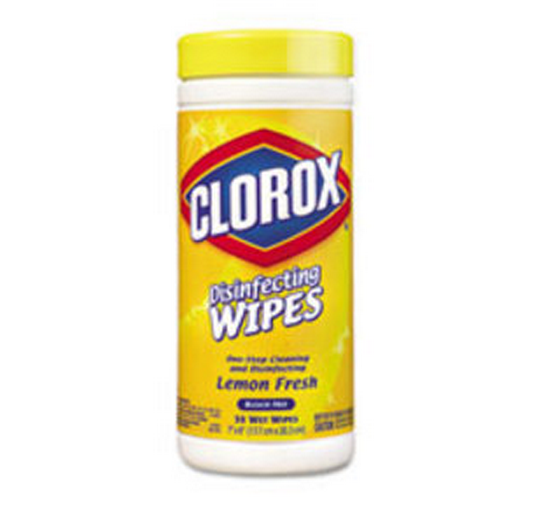 Lemon fresh clorox wipes are a must to keep surfaces clean and germ-free.